The mural at All Saints Regional Elementary School in Manahawkin, NJ was funded by the NJ State Council on the Arts Young Audiences. The theme was the beatitudes. The school had decided on symbols like hearts , hands, footprints, rocks, rainbows, butterflies, to name a few, representing the various beatitudes. 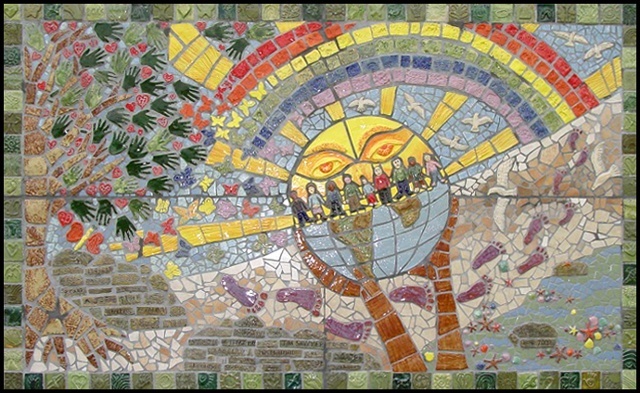 I worked with a core group of about 25 fifth and sixth graders designing the mural, and art teacher Beth McIlmail and I worked with students from the entire school making the tiles. The core group did the mounting and grouting of the tiles with the help of some senior citizens from the community.